This is my latest work in progress - I call it a shrug, but it's official name is "Beta's Nashua Vest'. I found the yarn at a shop in Bayfield, WI last weekend. I fell in love with it and tried it on in the shop. They had worked up their version in a green colorway. I thought the dark brick colorway was very striking! 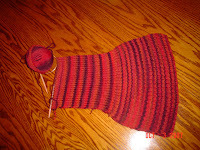 The yarn is Nashua Handknits' Vignette. It is 100% Superwash Wool. I think the yarn is working up quite nicely and can't wait to be finished. The photo shows half of the shurg.